Pour la rentrée, The French American Center vous propose de se retrouver pour un Apéritif Party, le Speed Talking Night. Au Programme, une soirée jeux et conversations en anglais pour apprendre à se connaitre. 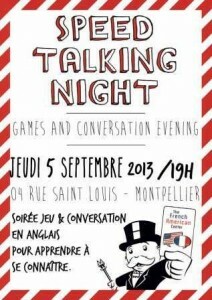 Le Speed Talking Night (Apéritif Party) c’est le Jeudi 5 septembre 2013 à 20h au French American Center. I will soon be moving to Montpellier and would be glad if you could keep me posted on your cultural events. I am an artist – pastel and oil. It will be a pleasure to hear from you in Montpellier. You can follow us on Facebook to keep posted on our cultural events.